I love being creative. I always have. Art, for a long time, was a very big part of my life. Drawing, Painting. Charcoals. Photography. Our house is full of pieces that I have created -- some hanging, some just waiting for space -- over the years. For a long time, it was a passion of mine. I was never GREAT, but I was decent. Decent enough that I loved doing it. Then life got in the way. Full time job. Marriage. Baby. Lack of space in our tiny house for my easel & tons of supplies. Right now, I simply don't have three hours to devote to a canvas when there are other things that I NEED to be done around the house or in my life. But I missed it. But a few weeks ago, during a class I was taking, I got bored. So I started to doodle. It wasn't great, but it was fun, and I realized that drawing, while not always my first choice for an art medium, could be the creative outlet I needed and was missing from my life. Inspiration from a new friend this past week, some amazing blogs & a quick trip to the art store on my lunch break was enough to get me back in the mood. So this weekend, I started drawing. I haven't come up with anything spectacular, but, I am looking forward to some online classes that I am signing up for this week. I am rusty. Really rusty. I need a lot of practice. But I am looking forward to that practice. My goal is at least 20 minutes a night, for now, of just drawing. I can manage that. I can do that while sitting on the couch with the husband. I can draw while Lucas sits in his high chair and eats his lunch on the weekends. I can, and will, make the time for this. It's a habit that I want to get back into again. Hopefully I will have things to share here. Filed under: art I heart. 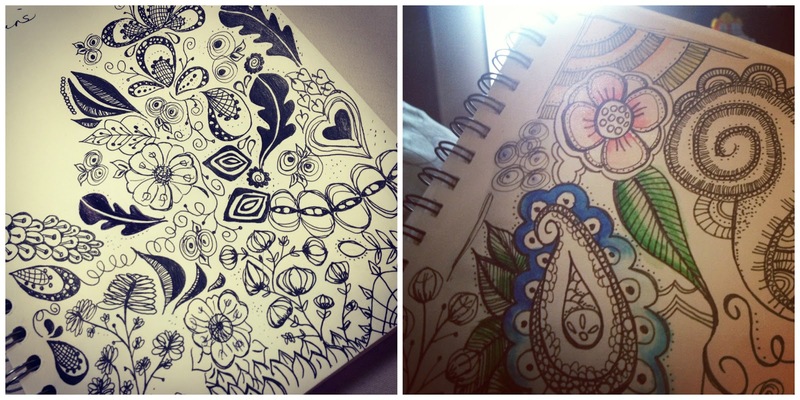 I absolutely adore your doodles. I love your doodles! I really want to venture into fabric design but I have to remember my computer programs because I don't feel like I can draw for anything. Dare I Say My Kid is Sleeping Through the Night? ?